The objective of the annual Business Plan Competition is to encourage student entrepreneurs and support the growth of jobs in New Jersey. In order to compete for the business competition prizes, there must be a serious intent to launch the proposed business. While the competition is open to current Rutgers University students, the leadership roles in the business venture must be filled by one of the three eligible categories: Rutgers Business School senior undergraduate students, current MBA students, recent graduates, and recent MBA alumni. For those current Rutgers University students who are not in one of the three eligible leadership categories, you can still compete in the competition. We can match you with a team of eligible members. Alternatively, if you are in one of the eligible leadership categories that would like to join the competition, we can match you with a team. Individuals or teams of up to five students/alumni can enter the competition. 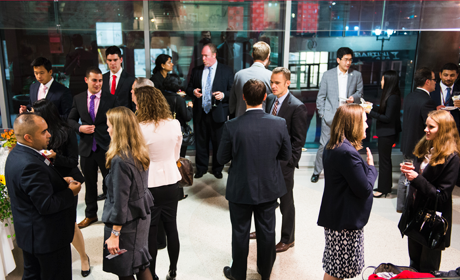 The Biopharma MBA Case Competition takes place each November and is organized by the Blanche and Irwin Lerner Center for the Study of Pharmaceutical Management Issues. Please join us as teams from top MBA programs from around the country compete to solve real world pharmaceutical industry challenges. Admitted teams will gain a unique opportunity to network with industry executives from eight prominent companies. Teams will also gain valuable hands-on experience solving a realistic industry problem. The competition also allows students to demonstrate subject-matter competencies in front of executives from leading healthcare companies. Teams of 3 to 5 students from the same university. Each team will be judged by a group of representatives from each sponsoring company of the case competition. The panel will be most interested in understanding how your team came to your case recommendations, the feasibility of implementing such recommendations, and your team’s ability to present and support your findings. Bayer, Bristol Myers -Squibb, Herspiegel Consulting, Novartis, Novo Nordisk, Quintiles. Below are all participating schools of 2016. If you have any questions about the competition, please contact us today.